Paul Hale, Joshua Wepman, Dylan Williams, and Jack Wang. The Timebase Correction (TBC) software package , used with high-speed sampling oscilloscopes, can correct both random and systematic timebase errors using measurements of two quadrature sinusoids made simultaneously with a waveform of interest. The estimated sinusoid is found by minimizing the average "distance" between the samples and the sinusoid. If we assume, for illustrative purposes, that there is no additive noise, we can estimate the total time error due to timebase distortion and jitter by drawing a horizontal line between each measurement (circles) and the distorted sinusoid. 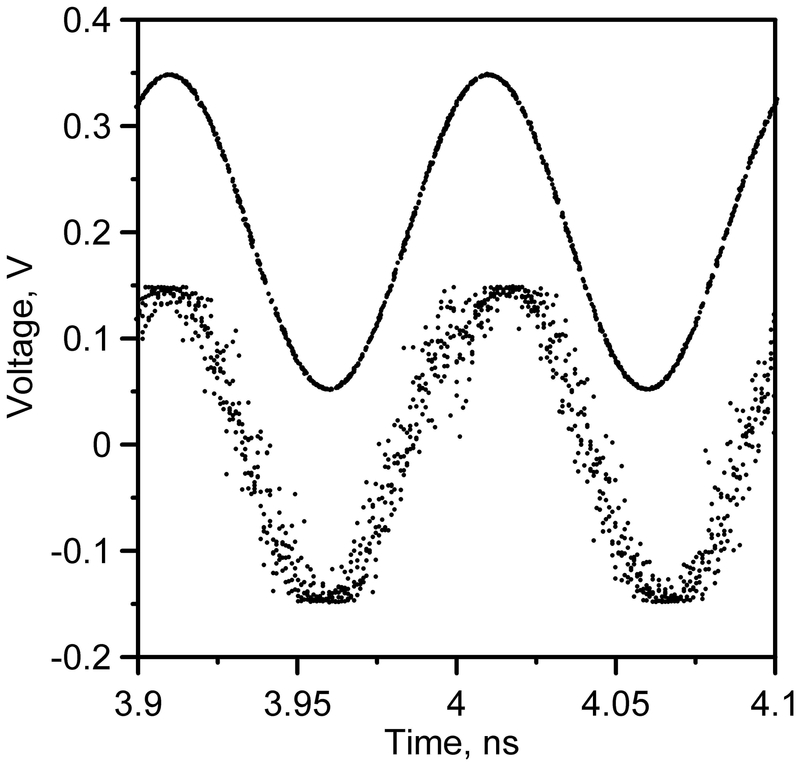 The length of each line represents the difference between the nominal (oscilloscope) time at which the measurement was taken and the time as determined by the distorted sinusoidal fit. The time that each line intersects the distorted sinusoid is the corrected time for each sample. Once the timebase error is known, it can be applied to a simultaneously measured signal of interest if the timing errors of the simultaneous measurements are sufficiently correlated. The figure below shows an actual measurement of five sinusoids measured simultaneously with the reference sinusoids that were used to calculate the timebase error. The estimated jitter before the correction was about 3.3 ps and the effects of timebase distortion are clearly visible at 4 ns. After correction for timebase error the residual error for this example is estimated to be about 0.2 ps. Correct both random and systematic timebase errors using measurements of two quadrature sinusoids made simultaneously with a waveform of interest. Portion of five sinusoids measured on a sampler before (bottom) and after (top) correction for timebase errors. The offset between the curves has been added for clarity. NIST Measurement Software is provided to you or your company (the USER) by NIST. The NIST Measurement Software bears no warranty, either express or implied. NIST does not assume legal liability nor responsibility for a USER's use of NIST-derived NIST Measurement Software or the results of such use. NIST Measurement Software contains work which was created by Government employees and is therefore not subject to copyright. The USER fully understands and agrees that any modification or selling of the NIST Measurement Software or any associated documentation, including but not limited to the contents of this document or User's Manuals, is strictly prohibited. To receive a free copy of the software, download the installation file , read the user agreement , and request a password. Please include the statement "I have read and agree to the terms and conditions of the NIST Measurement Software user agreement" in your e-mail. Included in User Help Menu.